In the morning on June 30, at Miyamori Elementary School in Ishikawa, Uruma, people offered floral tributes to Nakayoshi-Jizo. Fifty-five years have passed since June 30, 1959, when a U.S. F-100 fighter from Kadena Air Base crashed into Miyamori Elementary School in Ishikawa City, currently Uruma City. 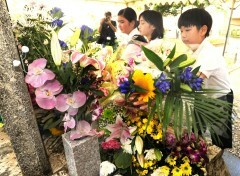 The 55th anniversary memorial ceremony was held on June 30 at the school. Participants paid their respects to the 18 victims. About 90 bereaved family members, former pupils who attended the school at the time of the crash, and local residents attended. The participants offered a thousand paper cranes and floral tributes to the Nakayoshi-Jizo or Good Friend-Jizo (the protector of deceased children) statue. The statue has the names of the 18 victims, including locals and pupils inscribed on it. At 10:40 a.m., the time the military jet crashed, the participants offered silent prayers.